Electriciens sans frontières and its counterparts in Europe (Germany, Italy, Spain) sign an agreement to pool their efforts to provide access to electricity and water for the poorest populations. The CICLE (International Cooperation on Climate and Energy) network is created with several partners with theaim of promoting, facilitating and supporting international cooperative actions in the fields of energy and climate. Café Lumière is a multifunctional platform which aims to develop “productive” and personal market services while supplying electricity for local public services (health, education). The project has been designed to be replicable. 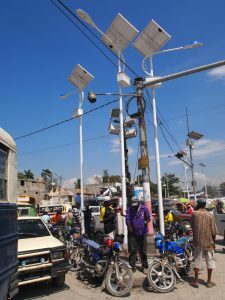 Designed in partnership with GRET and Positive Planet, it received financing from the French Development Agency (Agence française de développement (AFD)). The devastating earthquakes that hit Nepal between April and May 2015 kill more than 8,700 people and injured 18,000. Electriciens sans frontières volunteers fly to Kathmandu to board a plane belonging to the French Ministry of Foreign Affairs’ Crisis Centre. Present for over 15 years in Nepal, the NGO wishes to respond to the immediate needs of the affected populations. Thanks to the financial support of many partners, volunteers take turns to assess the situation in coordination with local authorities and intervene cas closely as possible with the population and in support of other NGOs. 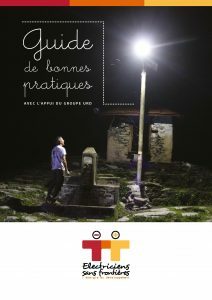 The NGO called on the Emergency Rehabilitation Development Group (Urgence Réhabilitation Développement (URD)) to develop a repository of best practices for access to electricity projects in rural areas in developing countries. It builds on many years of feedback and evaluation of our actions. It lists 12 quality criteria, illustrated by examples of good practice but also indicating mistakes to avoid. In September, the United Nations declares that “access for all to reliable, sustainable, modern and affordable energy supplies” is the 7th Millennium Development Goal. In December, COP21 promotes the development of renewable energy to provide access to sustainable energy in developing countries. 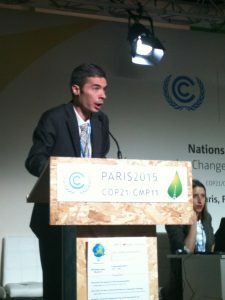 Electriciens sans frontières participates in several conferences on the place of energy in the fight against global warming and poverty. Every year in late September, the 14 regional offices of the NGO organise events to mobilise businesses, communities and the general public to raise awareness of access to electricity for the poorest. Electriciens sans frontières becomes one national association and reaches 1,000 volunteers. In 2013, it was recognised as a charity. In 2014, it received the Comité de la Charte’s “Give in confidence” approval. 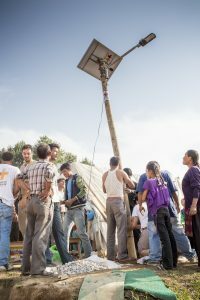 Following the 2010 earthquake, Electriciens sans frontières works alongside other emergency NGOs to meet their electricity needs as well as closely as possible with the affected populations. 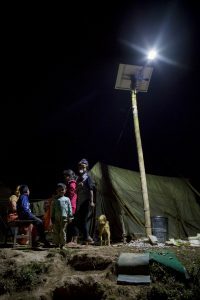 Between 2011 and 2012, 350 solar street lights are installed in the refugee camps to improve their living conditions and safety. Between 2011 and 2014, a second programme aims to light neighbourhoods that are being rebuilt in several municipalities with 465 solar street lights. These actions are undertaken systematically in cooperation with local authorities and local businesses and 100 apprentice electricians are trained to undertake servicing and maintenance. In 2016, a major programme began to electrify 500 schools and allow the partner Haïti Futur to install interactive digital whiteboards in each. 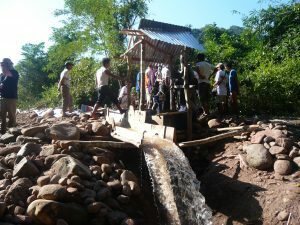 Between 2007 and 2017, 36 very isolated villages in the districts of Nhot Or and Phongsaly Laos accessed electricity through means of pico-hydro generation. The approach was based on learning how to develop a sufficient mastery of the technical approaches and reactions suited to the particular technology of pico-turbines. The other part was to establish an organisation adapted to the financial sustainability of the facilities. The Pintat amendment allows stakeholders from the public electricity and gas distribution services to devote up to 1% of their budgets for actions in the field of public distribution of electricity and gas conducted abroad. For more information. The NGO is involved on Gan Island as part of the reconstruction of more than 500 houses, a hospital, school and road infrastructure. The first project in Madagascar meets the needs of a local dairy cooperative for adding value to its milk production. Zebu breeders have understood the value of transforming and preserving their production instead of losing it due to the market’s insufficient capacity absorb it in the short term. The project begins with organising the breeders and is followed by the creation of a cheese factory and the production of electricity to meet the needs of a local factory. It end with the supply of electricity to dwellings. 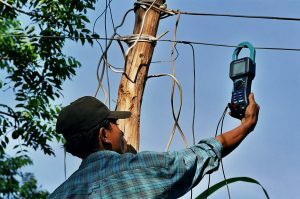 Since then Electriciens sans frontières ahas conducted many projects in this country. The French League of Education (La Ligue Française de l’Enseignement) had established “Training Schhols in Siem Reap” where apprentices were trained and integrated into various reconstruction projects then under way in the area of the temples at Angkor. It requested CODEV to renovate the means of production and distribution of electricity and water in the city. The work is done together with apprentices. Since then, many projects integrate training schools in coordination with local vocational training centres. In the Tokombere region of Cameroon a project is being undertaken to bring a hospital network up to standard, install efficient medical devices and train people for the maintenance and repair of facilities. Some150,000 inhabitants are benefiting. Following this training school, a college has been opened and is connected to the network. This is the first time the NGO combines two objectives that guide its actions: access to education and health care.